Activision has announced the upcoming release of Skylanders Trap Team on tablet devices. This won’t be the first time the Skylanders brand has appeared on mobile, as Skylanders Battlegrounds (for one) was released with its own mobile-specific starter pack in 2012. 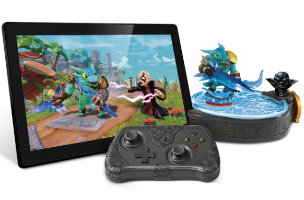 However, Trap Team marks the first time a full Skylanders game will be available on tablets, as well as consoles. In Skylanders Trap Team, aspiring Portal Masters will complete the same story as console players, exploring “expansive environments,” with a new twist on the series’ existing gameplay. In Trap Team, users can trap villains in real-world traps, and use those traps to play as those villains later on. The game will offer two control schemes. An included Bluetooth controller offers a control scheme similar to that of the console version of the game, while touch controls allow the game to be played using only the device screen itself. As players collect Skylanders, these figures will be cross-platform compatible, and will retain their skills and upgrades from one use to the next. “Skylanders has become an incredibly appealing brand and franchise for kids around the world. And the tablet has become an incredibly appealing gaming platform for kids around the world. But we haven’t been able to bring the full Skylanders experience to the tablet until now,” said Eric Hirshberg, CEO of Activision Publishing. The Skylanders Trap Team Mobile Starter Pack will include a Bluetooth Traptanium Portal for bringing characters to life within the game, a Bluetooth controller, a tablet stand, two Skylanders characters, two traps and a display for tracking the Traps and villains users have collected. The game will launch on iPad3+, Google Nexus 7, a variety of Samsung Galaxy tablets and Kindle Fire HDX tablets on October 5 in North America, October 10 in Europe and October 2 in Australia. The Starter Pack will retail for $74.99 USD.